Pistachio..What Did I Ever Do To You? A day late and a topping short. I had this great PLAN. St. Patrick’s Day was coming. And I bought corned beef and cabbage, the works. I totally didn’t even know how to cook it. (You so know my twitter peeps came thru on that part) Just throw it into the crock pot and walk away. Done. You knew there was a BUT comin’ didn’t you. I also had this second part to my plan. THE DESSERT. I got the idea from slc.citymommy.com. What could be better than PISTACHIO CAKE for St. Pat’s!? I totally love pistachio pudding. I do. Call me a geek, call me crazy. I bought the ingredients I knew I didn’t have; including heavy whipping cream. I couldn’t remember how much cream I needed tho? A whole pint, a half pint? What the heck..go all out, I bought the big one! And then. I figured maybe the cream was still okay? I’d just hurry and stick it in the freezer, get it cold quickly and hope? Maybe? I made the cake, it was beautiful! Green Goddess Beautiful. And later I went to make the whip cream frosting…. oh crap. How long did I end up leaving that stinkin’ whipped cream in the freezer! Ahhh. Totally frozen! (PS, it says right on the container? DO NOT FREEZE.) It should have the warning ‘distracted moms need not apply’. I tented the cake, and went to bed. And then later the next day, after the kids’ parent teacher conferences, I ran quickly to the store to grab that DANG cream. I DID NOT HAVE MY WALLET? Is this a curse!? At least it was in the van.. I ran back out, and back in and oh my gosh I was a MOM on a MISSION by this point. I’m getting my Pistachio Cake come leprechauns or green clovers. I pulled up the topping recipe and GET THIS. I mean oh. my. holy. cabbage. The recipe calls for a whole pint of heavy cream. YES. I bought a half pint the second go round. I made that bad old topping anyway. And WORLD? Here is the most amazing cake I think I’ve ever made. 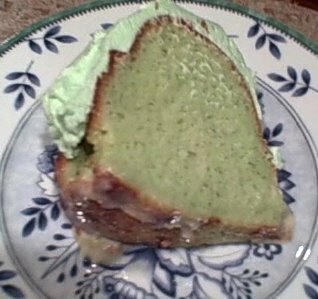 It’s not pretty, but holy moly it’s moist, and over the top sweet, and green for Pete’s Sake! Happy St. Patty’s, maybe next year I’ll get to eat it on time. 1. CAKE:Mix all the cake ingredients together and pour into two 9” cake pans or one bunt pan. 2. Place in oven for 35 -45 minutes at 350 degrees or until a toothpick poked into the center of the cake comes out cleanly. 3. GLAZE: In a medium bowl, combine canned milk with sweetened condensed milk and stir until smooth. When cake comes out of the oven, poke holes into it in even rows using a large fork or chopsticks. Pour milk mixture over, allowing it to soak into the cake. Refrigerate for several hours or overnight. 4. PISTACIO ICING. Place your bowl and beaters from your electric mixer in the fridge for 10-15 minutes. 5. Once the bowl and beaters are chilled start to mix the heavy cream and one box of Instant Pistachio pudding slowly at first then gradually increase to the maximum speed of your mixer till you have soft peaks. Mine was a bit thick.. maybe add some milk to make a better consistancy? I combined two different recipes to create my version: This Coconut Splendiferous one for the Glaze. 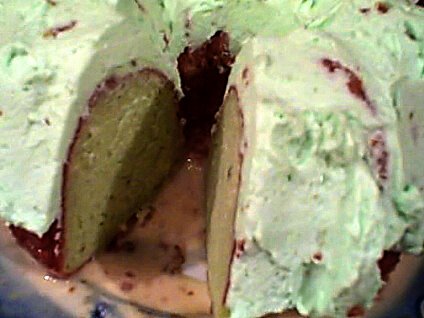 And this Pistachio Wonder for the cake and icing. Rachel From ASouthernFairyTale has other..probably BETTER recipes go check! You are currently browsing the archives for the recipes of terror category.